Established in 1887, the National Museum of Singapore (NMS) is the country’s oldest museum, containing an impressive array of artefacts and exhibits that weave the story of Singapore’s colourful past. The NMS abandons the conventional arrangement of exhibits in a chronological order, instead opting to section the exhibits by themes such as film, photography, fashion, and food. These exhibits are supplemented by interactive videos that help to bring the otherwise-static artefacts in each section to life; for example, one short video in the ‘Food’ exhibit tells a heart-warming tale of how the roaming noodles hawkers of old helped to foster a budding romance in the 1970’s. The rich audio, visual and interactive elements in each section help to make each section feel like a sensory immersion into Singapore’s history. Over and above these permanent exhibits, the NMS also often plays host to a number of temporary exhibits of artefacts from all over the world, from Victorian wedding dresses to Ukrainian gold. Furthermore, if you plan your visit well, you might also be able to attend local arts events such as the annual Night Festival, which are usually held in or around the NMS due to its size and central location along Singapore’s shopping district. The interactive exhibits and the heavy focus on story-telling at the NMS mean that you don’t have to be a history-buff to enjoy all that the museum has to offer. Whether you’re a first-time visitor to Singapore or a local who has lived here all your life, the NMS is bound to capture your imagination and shed light on the inimitable Singaporean culture. The NMS is located along Stamford Road, and is easily accessible by car, taxi, and all forms of public transport (the nearest MRT stations are Dhoby Ghaut and Bras Basah). It is located within walking distance of the scenic Fort Canning Hill and several other prominent museums, such as the Singapore Art Museum and the Peranakan Museum. The entrance fee (not inc. temporary exhibits) is $10 for adults, $5 for those with concessions and free-of-charge for children under 6. Family passes are also available. 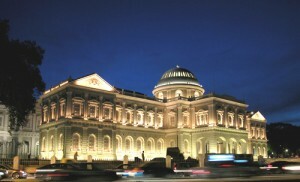 More information is available at the NMS website here: http://www.nationalmuseum.sg/.